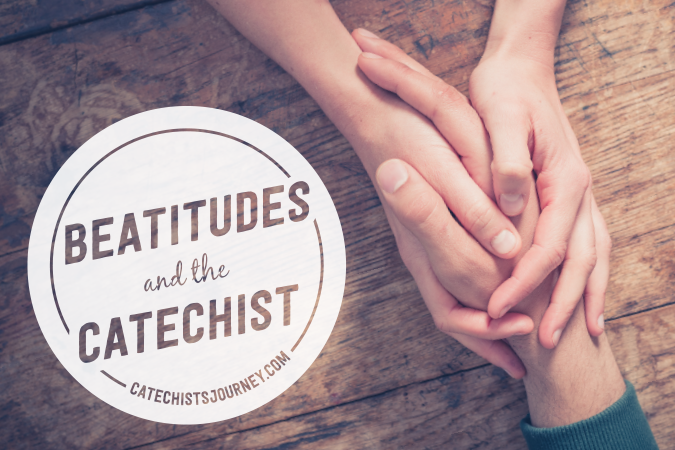 This is the fourth article in a series exploring the Beatitudes as they relate to being a catechist. Happy are the catechists who help young people find God in all things, for they will find God in them. I really was. I had planned to begin class with a 3-Minute Retreat, but the technology didn’t cooperate. My opening discussion questions fell flat; “I don’t know” seemed to be the only words the young people knew. No one laughed at any of my jokes. And I rushed through my lesson, forgetting that catechesis is not about filling up young people with information—it is an encounter with a person. Perhaps Carrie was better off not attending class that night. As I continued typing the e-mail to Carrie’s mom, letting her know what Carrie had missed in the night’s lesson, I realized that my disappointment in the way the class unfolded reflected a deep hunger: I want to make a difference in the faith of young people. I want to help them know Jesus Christ not just as their Lord and Savior, but as their friend. I want them to know that the Church is their home. I want to help them discover the freedom to do God’s will and live lives of love, mercy, and compassion. I want them to see that the Kingdom of Heaven is a present—if incomplete—reality. In short, my disappointment revealed the truth that I hunger and thirst for righteousness. As I reflect on that hunger, I realize that God always satisfies it. God satisfies it whenever young people share moments of gratitude at the beginning of each class. God satisfies it whenever the young people tell me how much they needed the peace and quiet they found during a guided meditation. God satisfies it every time they smile and laugh. And God always satisfies my hunger when I witness young people celebrate the Sacrament of Confirmation. In that moment, I see the evidence of everything that I hoped for—an encounter between young people and their Lord—in the joy and love on their faces. In helping them find God, I discovered that the young people had helped me find God in them. Yes, I hunger and thirst for righteousness, and I have been filled. But I am beginning to realize that I hunger and thirst for the young people’s righteousness. I trust God will fulfill that hunger and that thirst too. What hopes do you have for the young people in your class? When has that hope been fulfilled? Explore how the Beatitudes show us how we can be truly happy and share happiness with others in Finding God, Grade 4, Unit 2.